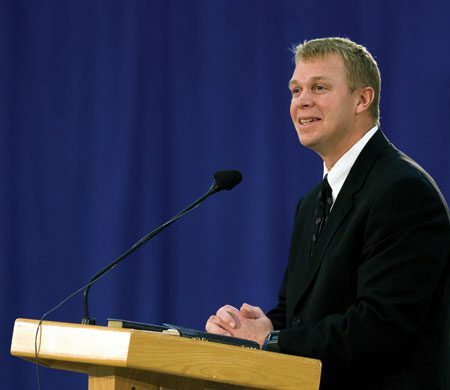 Cougar football coach Bronco Mendenhall will speak to alumni on Feb. 13. The BYU Alumni Association will present Bronco Mendenhall in a live broadcast on BYU Television Feb. 13, 2009, at 7 p.m. MST. Mendenhall will draw on his life’s experiences to share principles that will be of interest and benefit to a diverse audience. Also featured will be Vocal Point, BYU’s popular male a cappella group known for its inventive arrangements, humor, and vocal percussion. Originating from the Gordon B. Hinckley Alumni and Visitors Center at BYU, the event will be available in English and Spanish and will be rebroadcast several times to accommodate a worldwide audience.